This rabbit hutch with large pen provides an ideal opportunity for exercise any time your rabbit wants due to the built-in ramp and ground level enclosed run. 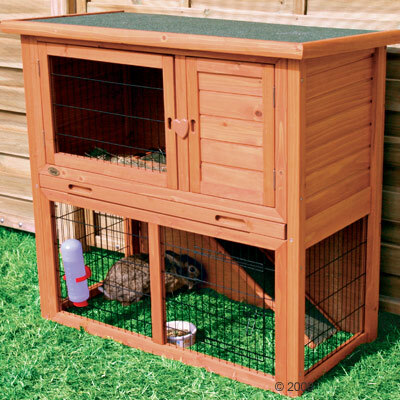 Due to the size of this rabbit hutch, it is ideal for appropriate and humane keeping of pairs or groups of rabbits. It includes an enclosed hutch area and offers a closed area for quiet retreat. The hutch can be opened from the front. The plastic-coated base tub is removable and especially quick and simple to clean. The outdoor enclosure has a front and side door. An additional "attic" can be used as a storage area or can be filled with straw in the winter to offer better insulation. The pine is treated with a special stain and similarly the roof is specially coated. This makes the hutch waterproof and suitable for use in winter. Suitable for keeping a pair or group of animals. Pitched roof and outdoor pen enclosure. Expandable with product ID 33224 Natura Outdoor Pen.